Terry Glavin: "Pacifism is objectively pro-Fascist." Welcome to the “neocon warmongers” club, comrades. I know the Orwell quote. As a pacifist because of my faith it is something I consider a lot. World War 2 is seen as a justified war, but the Allies did not continue it to liberate Europe and left central and eastern Europe under tyranny until the people liberated themselves. A great example of the problems with the end of the war comes in with Finland, a democracy that had to surrender 1/10 of its country to a totalitarian invader, land that has still not been returned. The Allies also did not support China in being an open society. War is complex at all times, it is messy and it is not typically a clear cut result as the winners want the world to think. That said, I understand that by accepting the police existing I am accepting the use of force to defend the civil society. I also believe that if Canada is to have a military, there are few places in the world that make more sense to use it than Afghanistan for this mission. Good points, Bernard. You too Matt. As is quite normal Orwell is quoted by people who have either not read him or understood him. What about when "western interests" clash with popular demands in the region? There's a history here that we ought to remember. The secular nationalist Wafd party won Egypt's first elections in 1924; and they kept up their winning streak over the next decade. But, acting in concert with the Egyptian monarch, the British made it impossible for the Wafd party to exercise any real sovereignty. "Stability" and "security" in the Middle East, defined by Washington, has for too long been our primary reference for thinking about these issues. This dismal truth was to be more widely felt among Arabs as the United States replaced Britain and France as the paramount power in the Middle East; and securing Israel and the supply of oil joined the expanding list of western strategic interests in the region. The proliferation of the now-ubiquitous binaries (western liberalism versus religious fanaticism, stability versus Islamism)proved so inept at reading Egypt in the last two weeks. That's important to remember. RE: As is quite normal Orwell is quoted by people who have either not read him or understood him. Unlike you, oh wise one, who clearly does understand Orwell, given your clearly superior powers of perception. RE: What about western interests blah blah yawn yawn. "If we can admit that much. . ."
Frank: My "we" does not include these "western interests" you are obsessed with blaming for all the woes of the so-called "Muslim world" like it was soem alien planet where the laws of gravity are different. My "we" includes "them." They are not my "other," and I feel more at home in Mazar-e-Sharif than in san Francisco. I suspect you might be my "other", but I will give you the benefit of the doubt in the hackneyed slogan that usually accompanies the sollopsism and narcissistic personality disorder that inflects the self-proclaimed anti-imperialists of our time: Speak for yourself, but Not In My Name, okay? My comment got lost but I was responding to the Commentary dude and others. Not you. His "our stability" and "western interests" offerings end up never being discussed or defined. Mona Eltahawy goes on CNN and roars, telling them to drop defining what's happening as "chaos" and "instability" and instead call it liberation. A historic moment for her people and yes our people. That's what I'm getting at and apologies if you took my dig at the Commentary piece to be directed at you personally. No one - absolutely no one - embodies the crippling stupidity of the American intelligence establishment better than Scheuer. You don't have to have a too-finely honed sense of irony to notice that this "terrorism expert" is so-called owing to his job at the CIA, when he ran the Osama Bin Laden desk. The greatest intelligence failure in American history occurred on this guy's watch, right under this guy's nose, but he disses George Bush and bcomes an overnight sensation, and ever since he's been drooling about the "clandestine" ways that the Jews secretly run American foreign policy; when he got bad press for that, he blamed the secret power of the Jews for his problems, earning even more cred-points from stoppists and hippies. He's a living, breathing stereotype of the Big Fat Stupid Yank, and Commentary gives him space for his dribblings about Egypt, if you please. Huzzah! To be perfectly magnanimous Canada has a Big Fat Stupid Canuck to match (although strictly speaking he too is an American, but nevermind): Eric Margolis. Recently ditched by the Sun newspaper chain, still a foreign policy "expert" cited routinely by CTV News, Margolis is the darling of Canada's "anti-war" set. He describes the Taliban as a "religious anti-communist" militia that has risen up against the "communist" government in Kabul. Leftish pseuds cite him as an authority on Afghanistan all the time, not noticing that Margolis is a co-founder of Pat Buchanan's extreme-right American Conservative managazine. Margolis is also an "alternative medicine" gazillionnaire, the heir to the Jameson's Laboratories fortune. Snake oil, huzzah huzzah! Margolis and Scheuer should hang out a shingle together: Wankers R Us. Btw, Some of this "prism"/western interest/"we" stuff comes across as vague and needlessly nit picky. Another way to put things, is to ask why Al Jazeera undeniably had a great pulse, more interesting and imaginative (Zizek was transfixing folks for half an hour) coverage than CBC, CTV, CNN and other assorted network news? I've got my own insight but just putting that out there. ps Hell yes. Lets open up the airwaves and allow for an intellectual revolution that makes space for the Dabashi's (a wonderful Iranian American scholar) of the world. "We must, once and for all, change our interlocutor, and begin to talk to ourselves. From Tehran to Tunis to Cairo and beyond, our innate cosmopolitan cultures are being retrieved, our hidden worlds discovered, above and beyond any anxiety of influence. Egyptians are now achieving our collective future—for all of us. It was not destined for Iranians to do this in 2009--but the victory of Tunisians and the triumphant will of the Egyptians in 2011 will have unequivocal consequences for all other democratic and national liberation movements in the region." Just watched Tariq Ramadan and Slavoj Zizek on Al Jazeera. Zizek had the occasional spasm of brilliance, but I was astonished with Ramadan. I thought he was supposed to be some smart guy. Says the worry about an Ikhwanist counter-revolution a la Iran 79 is just "Israeli propaganda." What a goof. It's the very worry that's haunting the sleep of all the Iranian democrats watching events in Cairo. Ramadan is a greasy, slippery character. Wouldn't trust far as I could throw. 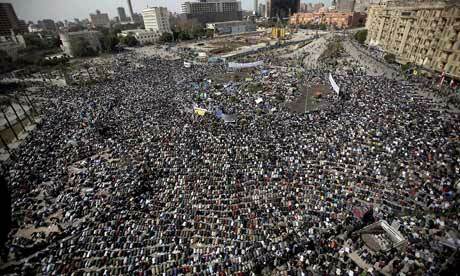 Many Iranian democrats are on the streets today inspired, I'd argue, by Egyptians. Dabashi sens this too. And Zizek pretty much makes the same argument as Ramadan, saying that the because of the balance of forces, in Egypt, and various schisms within "Islamists" forces--the fact that it was the Brotherhood who were forced to adopt universalist language, not the other way around--makes an abject mockery of the fear mongering much of it inspired by rather pernicious motives having little to do with wishing Egyptians well. Zizek goes on here. Great stuff. "The cynical wisdom of western liberals, according to which, in Arab countries, genuine democratic sense is limited to narrow liberal elites while the vast majority can only be mobilised through religious fundamentalism or nationalism, has been proven wrong." In all my work in and about Afghanistan over the past few years, that "cynical wisdom" is exactly what animates all my enemies in the "troops out" camp. it is no small irony that the American president who comes off looking good in this is Bush and the secretary of state that comes off lokking good is Condi Rice - they were pushing for real democratic transformation in the Arab world before the all leftish critics using this as annother opportnity to talk trash about "the west" even noticed there was a democratic potentional in the "Arab street." ". . .once they approach victory, their unity splits, they engage in a deadly fight," which the good guys lose because their enemies are so depraved. Zizek trivializes this, both ignoring and exhibiting what the late Fred Halliday called "signs of a far more developed and politically articulated accommodation in many parts of the world between Islamism as a political force and many groups of the left. . . .The latter show every indication of appearing to see some combination of al-Qaida, the Muslim Brotherhood, Hizbollah, Hamas, and (not least) Iranian president, Mahmoud Ahmadinejad as exemplifying a new form of international anti-imperialism that matches – even completes – their own historic project." Zizek is committing the same folly Chris Harman committed with his "with the Islamists sometimes, with the state never" line. An unmitigated disaster. You want slaughter the "left" Zizek purports to champion? That's how you do it. Until the 1950s, the Muslim Brotherhood waged a war of liquidation against the Egyptian left. Who came out on top in that "deadly fight"? Zizek's embarassing depiction of Waziristan Talibs are some sort of agrarian reformers is wince-making, and he gets worse from there, depicting the PDPA putchists of Afghanistan in 1978 as some sort of indigenous revolt against the elites. The Stalinist PDPA was at the very pinnacle of the Ghilzai tribal elites. Of the core PDPA Stalinists, all were from the Pashtun ruling class, and 14 of them were Columbia University grads. Not a few of the PDPA Stalinists went on to become Taliban commanders. Zizek's class analysis would be fine, except he gets it exactly upside down. Then he slags Blair for hoping for something better than a failed-state apocalypse? What a moron. He shold stick with movie reviews. But Tony Blair's description of Mubarak as "immensely courageous and a force for good", at the moment that the uprising was gaining steam, demonstrated a perverse hypocrisy exposing the double standards of many who have preached "democratization". It was vomit inducing, pathetic and a slap to the face of Egyptians braving the storm. On par with Condi's gross "birthpangs of the new Middle East" description of a devastated Beirut, bodies laying still in piles. Throwing a whole range of "Islamists" entities together without context really makes no sense. For once the NYT ran an eminently reasonable worth reading lay-out. "That's how you do it. Until the 1950s, the Muslim Brotherhood waged a war of liquidation against the Egyptian left. Who came out on top in that "deadly fight"? The most violent and fanatical ideologies emerging from the Egyptian Brotherhood, often then exported abroad, took shape in the prison and torture cells of Nasser who ruthlessly suppressed opposition. Unimpressed with the NYT editorial. Can we at least remember here that I'm the one putting up all these cheery, Go Egypt postings? I dont need to be convinced of the great democratic yearnings you'll find in the most blighted corners of the "Muslim World," having spent a greater part of my travels in recent years to just such places. Thiis is why I'm unimpressed with the NYT: "Of countries in the region, only Turkey has managed to incorporate currents of political Islam into a system that has so far proven viable." You know how Turkey did it? By pulling down the Caliphate. Attaturk decided early: Round up the clerics, take them out into the desert, kill them all. Why was Tunisia such a breeze? A half-century of hunting down Islamists and killing them. This is a complete inversion of reality: "The Musli Brotherhood. . .has long been the most organized and credible opposition to Mr. Mubarak." Organized, yes. The MB gave us Hamas, after all - the worst enemy Palestinian freedom has ever known. A "credible" opposition? So credible that in the first serious challenge to the Egyptian police state in 30 years, the Brotherhood had nothing to do with it at all and were nowhere to be seen. How credible is that? For decades, Mubarak tolerated the MB opposition, every now and then throwing them up against a wall. He's the one who exaggerated their importance: 'Don't like me? Just look over my shoulder. Would you rather deal with the Ikhwan?' The MB served Mubarak well. That's irony for you. Here's some more: When the Brotherhood finally and unambiguously proves itself to be an impotent, reactionary shadow of the Nazi-collaborationist currents from which it emerged, the establishment press in the west responds: Well then, it just goes to show the Brotherhood isn't so bad after all. I would prefer not to lap this up, thanks. And what really sticks in the liberal intelligentsia's craw is that the tectonic convulsions that roared out of the Maghreb and now slouches towards Tehran passed right over Israel like a flock of doves. Drives people crazy. But we must blame Israel!! How can this be? I remain jubilant at the sight of what our Egyptian comrades have accomplished. I don't know where it's going, but I am going to savour the moment without a sneer disfiguring my face. For the moment, if only for the moment, I am perfectly content to live in hope: Marg Bar Diktator. "The MB gave us Hamas, after all - the worst enemy Palestinian freedom has ever known." Really is that your opinion? Nope the occupation and colonization of Palestinian land, that continues today, is the worst enemy of Palestinian freedom. Here we have plain hypocrisy where non violent dissent is routinely violently crushed by Israel--as mapped our in the excellent documentary "Budrus" and scores of human rights work. Until "western" policy makers understand this suffering that we actively aid, in its depth, we create more problems for the the Palestinians and the region. Incubators of hate. Yes, let is celebrate in the hopes of more freedom for those under repressive governments and unending violent occupation. ps I'm sure that you agree that Blair depiction of Mubarak being some saintly man of peace and good order (tell that to disappeared and tortured Egyptians) was blood curdling. "The MB served Mubarak well. That's irony for you." Yes, there's a lot of truth here. I'm wondering if you've read much Adam Shantz probably the most lucid chronicler I've come across. His piece last May was spectacular. Anyone who responds as though it is somehow contrversial to notice that Hamas is the worst enemy Palestinian freedom has ever known is someone who needs to go for a lie-down. And for the last time, knock it off with the "we." Check your damn head about "western" aid contributing to Palestinian suffering when it's "western" aid money pouring by the hundreds of millions into Gaza, which could have been Dubai, but which Hamas has turned into a Khomeinist-sponsored crackpot statelet capable of producing only a surplus value of savage violence and terror. For the last time, with your "we create more problems for the the Palestinians," speak for yourself. If you know nothing about the savagery of Hamas, would you at least not include me in your "we" who are somehow more blameworthy than even the death cult Hamas? You want enjoy the masochism of blaming the "west" for all this, go right ahead. Just leave me out of it. Okay but the savagery of the Israeli occupation is widely documented and its crimes are, among human rights groups, and sincerely interested parties hardly controversial. Nor is western hypocrisy. Where are the salutes for residents of Bi'lin facing imprisonment, massive repression for protesting week after week, non violently, against the annexation (60 per cent of their village has been annexed illegally by Israel). They are fighting for their right to exist, no? We need to speak these facts plainly. And is anyone surprised by now by blatant western hypocrisy. Here's the generous "aid" giving (the issue of occupation is political not "humanitarian") American administrations latest contribution. A reminder that there is a colonization process not a peace one. He also told the lawmakers that Washington was making a vigorous diplomatic campaign to stop countries from declaring their recognition of an independent Palestinian state, as several Latin American nations have done. "We have made very clear to a lot of countries ... that we think this is counterproductive. I'm disappointed, frankly, that we haven't had more success, but it has been in our engagement at the highest levels," he said." At the risk of allowing this conversation to degenerate from a celebration of brave and grassroots anti-totalitarian uprisings in Arab dictatorships into yet another dreary exercise is slagging off Israel, I would point out to you that talk is cheap, "BDS" histrionics exact their greatest costs from the prospects for peace, and regirgitating Palestinian grievances only contributes to the stalemate. You want to help Gaza? Fine Pay your taxes. Canada sends tens of millions into Gaza every year. You say "end the occupation"? Fine. So does Harper. For all the craw-thumping about Canada's position on Israel changing so radically under the Tories, nobody I spoke with last year in Israel, from Palestinian journalists to Canada's ambassador in Tel Aviv, could name a single substantive policy change from our mythical days as a "neutral" broker (as though there were something virtuous in being "neutral"). You know what would really help? When Arabs from Tunisia to Jordan start getting all chipper and hopeful about the possibility of democracy and freedom, don't turn the celebration into a "Let's Burn the Star of David!" event. RE: non violent dissent is routinely violently crushed by Israel. How can you spout sh*t like this with a straight face? If only the "dissent" were non-violent. First of all, it isn't "dissent," it's rejection of the notion of a separate Israeli (Jewish) state. And non-violent? give me a break. South African blacks, now their opposition to apartheid was mainly non-violent. Perhaps there are a few non-violent Palestinian protests, but Israel reacts to violent "protests," (if you call suicide bombings and rocket attacks "protests," I don't). To read that Israel routinely goes out of its way to crush non-violent protests when it faces so much violence -- and has since its inception -- is to see the Bizarro world come to life on the pages of this blog. I'm telling you Terry, I can feel it in my bones (or Jewish radar, if you prefer), this a-hole is pissed at the Egyptian army for announcing it's adhering to its treaties. And we know which treaty, and why. "You say "end the occupation"? Fine. So does Harper." Liberal era policy hardly reflected international law or the global consensus but Harper's been devastatingly worst. This claim is laughable. "You know what would really help? When Arabs from Tunisia to Jordan start getting all chipper and hopeful about the possibility of democracy and freedom, don't turn the celebration into a "Let's Burn the Star of David!" event." " "Allahu Akbar" and "Khaybar, Khaybar, oh Jews! The army of Muhammad will return!" "
Poor Frank. He has a temper tantrum about this: "You say "end the occupation"? Fine. So does Harper." He says my "claim" makes me some kind of right-wing nut. I made no "claim" in that statement. I offered no opinion (my opinion happens to coincide with that position, as if it matters): Canada's position was and remains that Israel should end its occupation of the West Bank. That is merely a statement of fact, and the facts make Frank go hysterical; he says to merely point out the fact puts me to the right of "even" Goldstone. Contentious: I was aware of that event. First things first: Every democratic embassy in Tunis should be taking pains to demand and assure security for that synagogue immediately. But let's not forget what the event implies. For weeks on end, some decrepit and marginalized jihadist groupuscule had to sit there and watch while hundreds of thousands of Tunisians, unenfeebled by their "It's all the Jews'/Israel's fault" propaganda, changed the course of history. Across North Africa, Islamist crackpots have been sustaining their worst rebukes in a half-century. They're enraged. They're taking out their rage on - what else? - a synagogue. The Harper government chose to either abstain or vote against a number of non controversial international resolutions calling on Israel to cease relentless settlement expansion that has all but killed the possibility of building a state. Canada stood alone before a United Nations human rights council yesterday, the only one among 47 nations to oppose a motion condemning the Israeli military offensive in Gaza. Canada's government acted to undercut critical findings about Israel's Gaza campaign in a UN report by Richard Goldstone, an internationally respected South African judge who is also a dedicated Zionist and long-time friend of Israel. We have a rather extremist government in Ottawa, operating outside the international consensus, ideologically committed in practice to the status quo--an Israeli state able to do whatever it likes,--law be damned--over the people it rules. I am going to give you one last chance. Nevermind your complaints that Canada failed to join Libya and the rest in some routine condemnation of Israel at some UN jamboree of Islamic-bloc votes and police-state interventions, and nevermind the offence you took when I pointed out the fact that Hamas is an enemy of Palestinian freedom and you nevertheless consider the Canadian government "extremist." What is this "claim" I made that makes me a proper subject of the all-purpose term of abuse "right wing"? I gave poor Frank several chances. This little wedblodge of mine, for some days, has been given over to celebrating the historic triumph of millions of Arabs who have proved that one never knows which will be the final lash that causes the slave to turn on his master. The astonishing events in Tunisia and Egypt are cause to be exhilarated, inspired, happy, frightened, pensive, as you like; the events most noticeably disturb the sleep of tyrants everywhere, but perhaps most noticeably in Iran. Tehran is the Bastille; one unavoidably wonders whether the moment approaches when we will see its ramparts stormed. The Muslim Brotherhood has been wholly sidelined, and the gargoyles it has created in Hamas, a death cult sponsored by Tehran, should also be expected to construe these events to its advantage. To no one's surprise - you can set your watch by this kind of thing - the Khomeinist and Ikhwanist propaganda strategy has been to pervert the meaning of the recent Arab triumphs by vomiting up a ceaseless stream of litancy-reciting abuse projected at Israel, the wicked Zionists and the scheming Jews/Zionists (either will do) and their puppets/puppeteers (either will do) in the imperialist-capitalist "west." Whether he realizes what he is doing or not, this is exactly what Frank is doing here. This is to say nothing of his bizarre assumption that I will tolerate the comments sections of this little blog being turned into a pamphlet distribution centre for this kind of thing, and to say nothing of his impertinence in expecting me to further allow him to use the comments here as an opportunity to post dirty invective against me, personally. So, I've deleted his last philippic, and any further comment from him - even the most abject and groveling apology, will be auto-deleted. The Committee To Protect The Revolution. The Latest News From The Weimar Republic. What A Travesty. This Guy Is One Of Ours.